Nate and I just got down watching Julie & Julia and it made me start thinking a little...maybe a little too much. 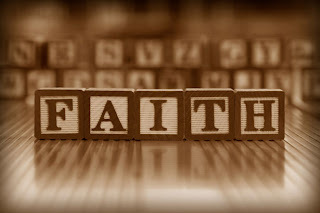 Faith is something that I've been struggling with recently. It's been difficult for me to turn things over and to have faith that God will catch me if I fall. Do you ever feel like this? It's almost how I feel sometimes when my faith is wavering. When I try to take matters into my own hands and not have faith that God will work things out. It seems that Aiva has always had one medical problem or another. We've had a rough couple of years but we've always made it through and kept faith. For the past few days I've been so in awe of how Bob DeVoe, the President of Lifeline, is handling the situation with what's happening in Haiti and knowing his wife is there and he is here. Every time I hear him, he is extremely calm and is confident that God is in control and that it will all work out. Why do we waiver...why do we second guess? When God has proven himself over and over again why do we doubt? Satan knows just where to get us. He's sly and brings us to our knees...but it's when we're on our knees that we start to turn to God and we ask for help to trust that God will work in our lives. Has Satan hit you to where you're on your knees and you need to turn to God? I know I am...it's been a rough week and I've tried to go it alone his week. Forgive me God and help me to trust that you know better than I. Help me to fully rely on you to get me through each day. Thank you for loving me and for never leaving my side even though sometimes I stray! Thank you El Roi for being The God who opens our eyes!